To escape a family scandal, Boston socialite Rose Winchester left home and took a job in a garment factory. 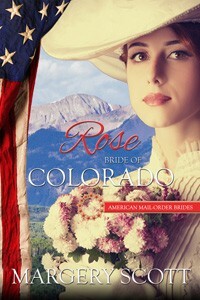 But after a fire, she is left with no means to support herself and is forced to become a mail-order bride. Although neither Charlie nor Rose expects their relationship to develop into anything more than friendship, love blossoms between them, but their fragile relationship is tested when secrets from the past threaten to tear them apart. Charlie Halstead leaned against the sideboard in the Bar-H ranchâ€™s kitchen, his ankles crossed and his arms folded across his chest. His father, Robert, paced the length of the room, slamming his hand on the thick oak table on each pass. Charlie met his gaze, even though one eye was already swelling shut and his cut lip stung like a hundred bees had been feasting on it. He didnâ€™t bother responding. Heâ€™d been on the receiving end of this lecture more than once over the years, and heâ€™d found it was best to keep quiet and let his father rant until his frustration was spent. â€œWhat?â€ Charlie spun around to face his father, then realized heâ€™d made a huge mistake. Pain ricocheted through his head and dizziness clouded his vision. Charlieâ€™s stomach twisted. Heâ€™d been well aware his whole life that both his and Eugenie Apsleyâ€™s parents had practically arranged a wedding between the two. But that was not going to happen. He couldnâ€™t imagine waking up to Eugenie every morning for the rest of his life. Time and time again over the years, he’d witnessed the sense of entitlement she’d managed to hide from his family — as if the world only existed to make her life easier. Heâ€™d seen the way she treated people when they were of no further use to her. His parents thought she loved him. He knew better. He was pretty sure the only reason she wanted to marry him was because she loved the idea of being a Halstead. If he did marry her, it wouldnâ€™t take long before the novelty wore off, and he wasnâ€™t about to get himself into a lifelong sentence of being treated like a hired hand. Charlie couldnâ€™t wrap his mind around the possibility that heâ€™d lose the ranch, especially to his good-for-nothing cousin. Edward was one of the laziest men Charlie had ever met, and the man didnâ€™t know one end of a branding iron from the other. The Bar-H â€“ the ranch where Charlie was born on and had worked with his father on for as long as he could remember â€“ would be ruined within a year. Charlie loved this land, loved every blade of grass, every tree, every stone. Heâ€™d woken up every morning of his life to a view of the snow-tipped Rocky Mountains, the fresh clean air, the sound of hawks screeching overhead. Heâ€™d always expected heâ€™d spend his last days here as well. Now, his father was threatening to take all that away because he didnâ€™t want to be saddled with Eugenie Apsley. â€œMa? You going along with this?â€ He set his gaze on his mother. Surely sheâ€™d take his side. Sheâ€™d always defended him, protected him, no matter what kind of scrape he got himself into. His father turned away, jammed his hands in his pockets and stared out the window to the pastures and grazing land in the distance. Bar-H land. Charlie noticed his mother dabbing her eyes with a handkerchief, but still, she didnâ€™t speak. Charlie shook his head, trying to wrap his mind around the ultimatum heâ€™d been delivered. With a sympathetic glance in Charlieâ€™s direction, his mother rose and followed his father out of the room. Charlie dropped into a kitchen chair and stretched his feet out in front of him. Eugenie â€“ or the ranch. What was he supposed to do? Sure, he was a little wild now and then, but he never shirked his responsibilities here on the ranch. And now, because of a little saloon brawl â€“ and it was a little brawl compared to some heâ€™d been in â€“ he could lose everything. But marry Eugenie? He let out a bitter laugh. No way in hell was that ever going to happen. He leaned forward, resting his elbows on his knees, gazing absently at the rough oak plank floor. The sun dipped in the sky outside, and shadows filled the room, but still he sat, searching for a solution. Either you get married and settle down, or Iâ€™ll take you out of my will and Edward will inherit the Bar-H. His fatherâ€™s words rumbled around in his brain. Suddenly, the answer came to him.